Circadian rhythm constitutes key photobiological signals for successive growth of cyanobacteria in variable environment conditions (Cohen and Golden 2015). The endogenous property of diurnal rhythm may alter optimum growth and production of cyanobacterial products in variable environmental exposure. Solar radiation consisting of ultraviolet-B (UV-B; 280-315 nm), ultraviolet-A (UV-A; 315-400 nm) and photosynthetically active radiation (PAR; 400-700 nm) serve as fundamental source of light energy for survival of cyanobacteria. The accessory light harvesting antenna complex, phycobiliproteins (PBPs) is well described as a primary acceptor in intermittent diurnal cycles of solar spectrum (Kannaujiya and Sinha 2017). Circadian induced response of super food cyanobacterium Spirulina platensis over 24 h light (L) and dark (D) cycle of UV-B, UV-A and PAR has been studied. PBPs efficiently absorbs >99 % of total solar radiation (Lao and Glazer 1996). The mid phase circadian exposure [12h/12h L/D] of PAR and PAR+UV-A (PA) showed significant increase in the amount of chlorophylls, proteins and phycocyanin (PC) whereas insignificant changes were observed on exposure of PAR+UV-A+UV-B (PAB) radiation (Fig. 1). Fig. 1. 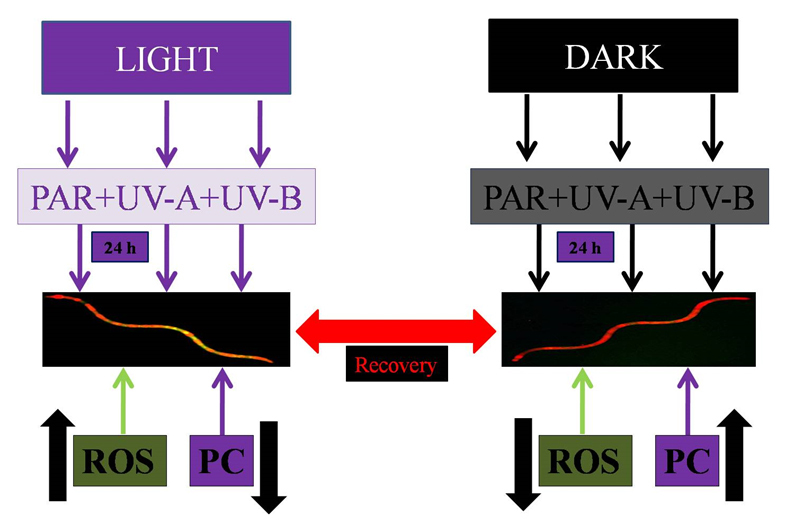 Circadian exposure of PAR+UV-A+UV-B on the cyanobacterium Spirulina platensis (PC concentration and reactive oxygen species [ROS] generation) in light and dark phase incubation up to 24 h respectively. However, chlorophylls and proteins were affected by further exposure after mid phase circadian periods. Carotenoid content increased upon PAB exposure (up to 24h L) which declined slightly in D phase. UV radiation-induced loss of photosynthetic efficiency in cyanobacteria has been well described (Sinha et al. 2003; Rajneesh et al. 2018). Moreover, the amount of PC was greatly affected in circadian exposure. PC declined in L phase of PA and PAB irradiation with significant differences (P<0.05) as compared to control. However, PC recovered significantly to same amount after 24 h of D phase. The percentage recovery was more prominent in PAB than PAR and PA radiation. Fluorescence of PC changed slightly in L phase of PAR exposure whereas more than 100 % recovery was observed in D phase with no significant differences (P>0.05). The wavelength shifting of PC changed slightly under rhythmic exposure of PAR. However, combination of PA and PAB showed maximum blue wavelength shifting in L phase with significant recovery in D phase. L phase of PAB induced free radicals in multiple folds which recovered to the level of control in D phase. Oxidative induced damage was diminished by antioxidative enzymes namely, CAT, POD, SOD and APX in 24 h circadian rhythm. In this investigation it was found that D phase was more prominent for induction of repair mechanism and inhibition of ROS generated during L phase. Several applications are credited to PC in various fields of biological science including pharmaceutics, biomedicines and biotechnology (Sekar and Chandramohan 2008; Rastogi et al. 2015; Sonani et al. 2015; Kannaujiya et al. 2018). Overall, the novel approach of L/D ratio of circadian rhythm could be utilized for optimization and enhanced production of PC as well as various photosynthetic and non-photosynthetic metabolites from cyanobacteria. Composition and functional property of photosynthetic pigments under circadian rhythm in the cyanobacterium Spirulina platensis.